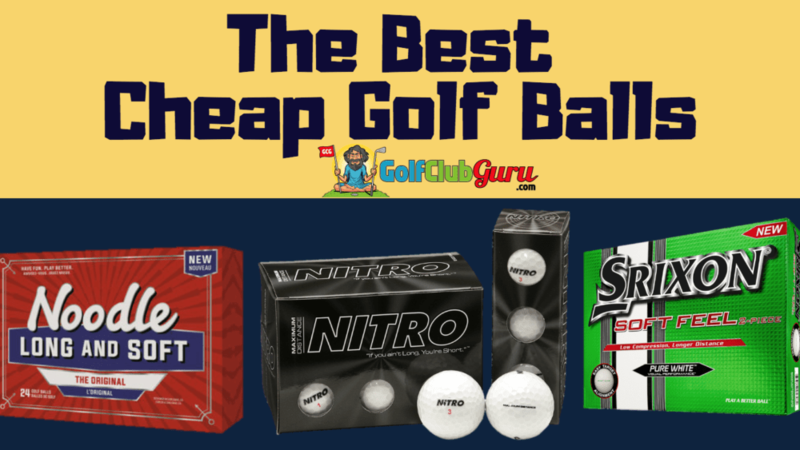 This article is clearly titled “The Best Cheap Golf Balls.” Please see my other articles entitled the “Best Worst Golf Swings” and the “Longest Shortest Drives of all Time”. And don’t forget the “Greenest Brownest Golf Courses”. I think you get what I am saying. There are good, high quality, expensive golf balls. You know the kind. Titleist Pro V1x’s, TaylorMade Tour Preferred, and Callaway Chrome Soft. Then, there are mid-tier golf balls like Bridgestone E series, Srixon Q Stars, and Titleist NXT Tour. Then… there are cheap golf balls. All types of Wilsons, most TaylorMade balls, Voodoo (owned by Strata, who is owned by Callaway), Mojos, Noodles, etc. If you costs you much more than a dollar a ball, it’s not a cheap ball. Another way to look at it: if it’s a brand new dozen golf balls, it better not cost more than $12-15. Otherwise, it’s not cheap. Let’s talk about the difference between a premium golf ball that is $4 a ball, as compared to a ball that is $1 a ball. It all depends on your skill level. If you are a brand new golfer, it will make no difference what so ever!! That’s right, that extra $3 you spent on the ball? That was a mistake with no upside. If you are a beginner, you are not going to hit a single shot where a premium golf ball would be more beneficial. If you are an average golfer, you MIGHT notice a small difference between a premium ball like a Pro V1 and a cheap golf ball like a Noodle. You might find yourself short sided on a green, having to chip to a hole where you only have 6 feet of green to work with. With a Noodle, you don’t have a good chance of stopping the ball quickly. (Let’s just assume the greens are somewhat fast AND you hit the chip exactly like you wanted, which isn’t too probable anyway). If you used a premium golf ball, you have a much better chance of the ball checking up and stopping closed to the flag. Other small benefits would include: better distance control, maybe a little longer on average, iron shots might stop a little quicker as opposed to rolling off, and better feeling shots in general, especially on chips and putts. Are these benefits worth a lot to you? Great, then go ahead and buy a premium golf ball. If not, you should stick with a low budget, cheap ball to save money. If you are a great golfer, you will FOR SURE notice a difference. Your swing is consistent and your short game is top notch. You need the ball to check up around greens, and you like the improved feel on all shots. You do NOT need to be playing with a cheap ball, and you already know that. If you are like me, you like saving money on golf. You don’t just want to save chump change though. You want to save enough money to make an actual difference. If you save enough, you might even be able to afford getting some lessons, joining a new club, planning a golf trip, having more money for range balls, or just being able to play more golf in general. To do that, though, you need to MAXIMIZE your savings. So, how can you save the MOST money possible when buying golf balls? Buy used golf balls. Used balls are obviously less expensive that brand new golf balls. You are going to end up losing the golf balls anyway, so you might as well buy new and save the money. Skip buying golf balls completely and just find them around courses. Look in tough to reach hazards. Go down the huge drop-offs. Uncover leaves and see if balls are underneath the layers. Drag your club in the water around lakes and rivers. I didn’t buy golf balls for years after loading up around courses. I love the thrill of finding golf balls for free! Buy in bulk. The more you buy, the more the seller is going to be willing to reduce the price. If you have the money upfront, it just makes sense to buy lots of balls at once. You will use them eventually, anyway. Consider all outlets. Check craigslist, Facebook marketplace, and local selling apps. Check to see if local courses have a used ball bin (probably won’t be a GREAT deal, but you never know). Check out my personal favorite website for buying like new, used golf balls at a huge discount. There are deals to be had out there! You just have to find them. 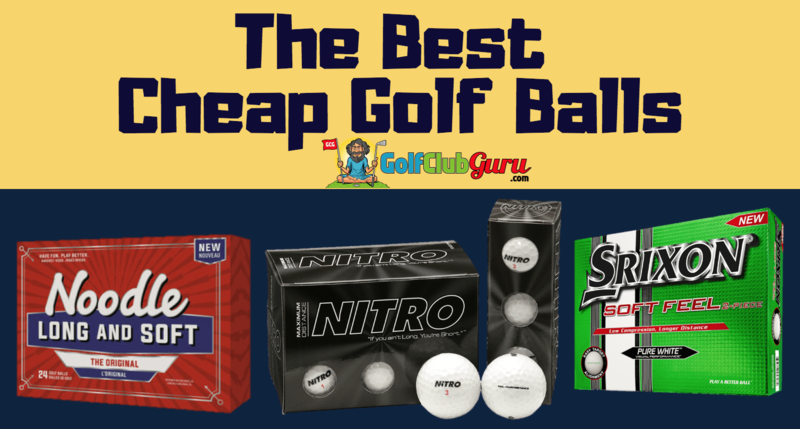 So, for those of you that know you need to be playing with a cheap golf ball… let’s dig in and find the best golf balls that you can buy for under $20 a dozen! Bonus points for balls under $15 and even $10 for a dozen. I’m going to split this article up into two different section. One for buying new golf balls, if that is what you want, and one for more budget conscious people that want to buy used golf balls! If you want to save money and hit the ball a long way, this is the ball for you. It will feel has hard as a rock, but it will fly far. If you are unsure what I mean, all golf balls have a type of feeling to them. Some feel very soft when you hit them, like you are hardly making contact. These are what most premium golf balls feel like. Then, there are golf balls that feel like you are hitting a stone when you make contact with the ball. That is what this ball feels like. But guess what? That’s why is is so cheap. And that hard feeling? Typically means the ball will fly further than most. So if you want more distance, and only more distance, this Nitro ball is great for you. If you are looking to really develop a consistent game though, you need to buy a higher quality ball. This ball comes in four different colors, and is priced at the lowest end of the market. Enjoy! Noodle golf balls are what most current day pros probably started playing golf with. They are extremely popular among beginners. That is because they are long off the tee and don’t feel so much like a rock, like the Nitros above do. Overall, it is a very high quality ball to start playing golf with, and I would highly recommend it. Many average to good golfers even still play this ball, because it is such a great deal. Most Noodles come in 12 or 24 packs, with the 24 balls obviously offering the best value. When it comes down to how much you spend per ball on brand new golf balls, Noodle golf balls are hard to beat. This ball is incredible. No question about it. I’ve compared it to golf balls 2x to 3x it’s price range with out giving it a second thought. To me, it is like a Noodle golf ball on steroids, and only for a few dollars extra. If you want the best value golf ball that you can buy, this is very possibly THE one. The ball will fly very far when struck correctly. It will stop relatively quickly around greens. You can’t ask for much more than that. Srixon sometimes has deals where all of their retailers heavily discount the ball for a certain event, like a golf major. So if you are patient, wait for one of those sales and stock up! When you can buy such a high quality, brand new golf ball for far under $20, you know you are getting a steal. Ah, so you made your way over to the smart side. By deciding to buy used golf balls, you will save way more money. By buying used instead of brand new, you can take your savings and instead buy a much higher quality, used golf ball. Or, you can just take your savings all the way to the BANK! Alright, if you are wanting to buy super cheap, underpriced used golf balls, you won’t be buying just a dozen or two. For it to be worth your while, you need to buy as many as you can afford. I would suggest at LEAST 50 to 100 golf balls. Think about how many you go through currently anyway. With that being said, here are the best golf balls that you should buy when looking for tons of cheap balls. When you are buying large lots like this, typically you’ll be buying a brand. For example, a lot of 50 Callaway golf balls will have all types of different Callaway models. Same with Nike. You’ll end up with a large variety of different golf balls that have been released over the years. You won’t just be buying 50 Nike RZN golf balls. Nikes are often times the ball of choice for frugal, budget conscious golfers. These balls are perfect for beginners, because they are long and feel pretty decent when hit. Durability wise, the ball will last practically forever, until you lose it in a pond that is! 50 golf balls is a good number to start off with. That way, you’ll have plenty for those tough water holes and other difficult holes. After this purchase, you can start finding golf balls in woods and hazards around your local courses. All together, these 50 golf balls will cost around the same amount that some people spend on just 6 brand new Titliest Pro V1x’s. So, be glad that you are saving so much money compared to them. Callaway is an incredibly cost efficient golf ball brand. They have released many great golf balls over the years, and this lot will have a large variety of different models that you can try out. The Nike 50 ball lot is the same exact price, but Callaway balls, on average, are of much higher quality so I’d recommend you stick with them. Compared to other cheap golf balls, this is a better lot, hence the small price difference. If you are a decent golfer, I’d say it is worth it though, as a better feeling golf ball is so much more enjoyable to play with. If you don’t give a single care about what golf ball you are playing, this is the lot for you. It will come with lots of different golf ball brands, and in a wide range of qualities as well. Considering that it includes shipping, though, it is an incredible deal. For a starter golf ball lot, it’s exactly what you need! Plus, this way, you can try out lots of different, low budget golf balls to determine which one you like the most. Good luck out there. Save some money, and have a great time!